One of the city's three pot shops will be at 1019 Chapala Street, currently home to a temp agency. Santa Barbara City Administrator Paul Casey just selected the three recreational cannabis dispensaries that City Hall will authorize to set up shop in Santa Barbara, bringing to a close an eight months long beauty pageant pitting prospective pot retailers against each other for the right to sell weed legally within city limits. It will be months, however, before any of the three cannabis retailers open their doors to customers. The three successful applicants now have to run the city’s normal design review gauntlet, a process that could last many months. The most striking feature of the three successful applicants — 14 applied and six made the final cut — was their location. Conspicuously, none are located downtown on State Street. Only one — Coastal Dispensary at 1019 Chapala Street — is located downtown at all. Of the other two, one — Farmacy S.B. — is located in the digs of the old Video Shop by De la Vina and Mission Streets; the other — Golden State Greens — is located at 3516 State Street, coincidentally in the site of a former medical dispensary — Hortifarm — long since shut down. Those hoping California’s new legalized pot rules, approved statewide by voters nearly two years ago, would usher in a new dawn of safe, legal, regulated, and taxed cannabis will have to hold their collective breaths for some time. In the meantime, a new medical dispensary has just opened its doors on Milpas Street — but a recommendation by a medical professional is still required. Another medical dispensary has been all but greenlighted for the 2600 block of De la Vina, but final paperwork has not been completed, nor has design review started. Assuming all are approved, built, and opened, the City of Santa Barbara will have five legal retail storefronts for cannabis consumers. City Hall established a series of criteria by which interested recreational cannabis operators would be judged and scored. To make the final cut, applicants must score at least 900 points out of a possible 1,000. The top three, in this scenario, would get the nod, assuming they were not located within 1,000 feet of any other applicants with higher scores. In this instance, the second highest point scorer — the Arizona-based retail giant SGSB — was disqualified because it was located within 1,000 square feet of the Chapala operation. SGSB scored only three points fewer than the Coastal Dispensary. To date SGSB has not disputed the selection process, but given the closeness of results and the stakes involved — Coastal co-owner Malante Hawthorne said the partnership has spent close to a million just getting this far — a challenge would not be unexpected. During public presentations by the six finalists, there was considerable push-back against downtown dispensaries on State Street. Some critics argued pot shops on State Street — especially in locations next to candy shops or clothing retailers targeting teen customers — sent the wrong signals. Others objected to the intense security vibe the shops would inject onto an otherwise low key and mellow street scene. In addition, some of the opposition was ginned up by applicants with shops proposed elsewhere. Coastal Dispensary may have come in first, but it’s located just a few hundred feet up Chapala Street from Ralph’s. During the public presentations, a corporate representative from Ralph’s spoke out vehemently against the Coastal proposal. Hayworth said he hasn’t spoken with anyone from Ralphs since then, but said he expected the security presence his dispensary will provide will help deal with homeless and street people who congregate on the patio in front of the supermarket. For Coastal, the Chapala Street storefront — which Coastal bills as the sort of pot shop one could take one’s mother to — is the stepping stone for a major enterprise. Coastal is currently in the running for manufacturing, distribution, and transportation permits for an industrial site on Reddick Avenue. In addition, Coastal is applying for retail permits in Lompoc and West Hollywood. Hayworth said he and his partners — local real estate professionals — own 85 percent of the company. Day-to-day management will be left to a minority partnership with ties to a Colorado-based enterprise, Native Roots, which claims to be one of the biggest retail and manufacturing ventures in the nation. Coming in second is Farmacy SB, led by Graham Farrar, who grew up in Goleta and helped found Sonos before branching out into cannabis cultivation. Farrar, who sits on the Santa Barbara County Bowl Foundation, has hired California Strategies, one of the biggest lobbying firms in California. 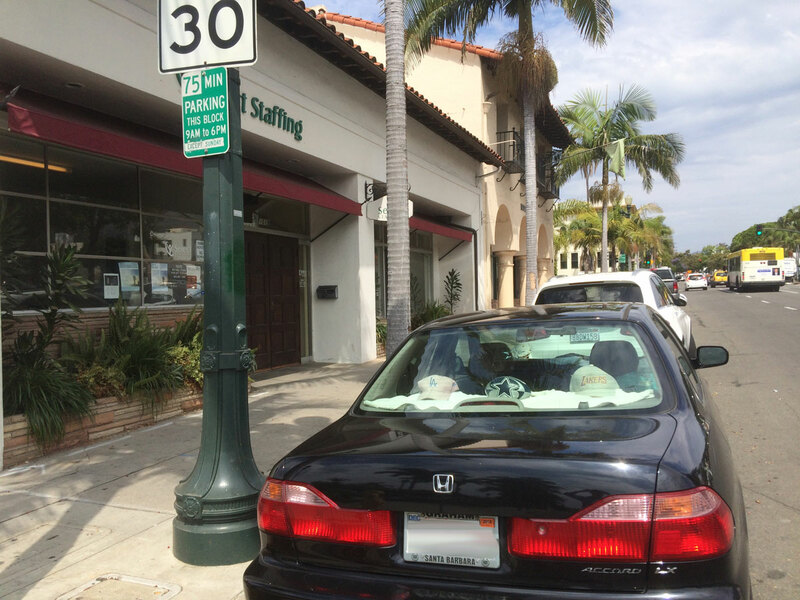 He’s also hired former Santa Barbara Police lieutenant and public information officer John Thayer to run security. Thayer currently runs security for the County Bowl. Adding even more to Farrar’s local lustre was the resounding endorsement by Geoff Green, head of the Santa Barbara City College Foundation. Given the location of the proposed Farmacy site — a stand-alone structure with no shared adjoining walls — there’s little risk of neighborhood opposition. The same might not be true for the third business selected, Golden State Greens, whose owners have a successful retail history in San Diego. During public presentations, Golden State’s location aroused the ire of some neighborhood residents who complained bitterly of its proximity to a nearby charter school. Critics also complained of the valet plan Golden State is proposing to address some of its parking needs. Whether it’s too late for such complaints — as many in the cannabis industry insist — is still to be seen. Wagner insisted the process is over and the decision likewise. The council, he noted, authorized City Administrator Paul Casey to make the decision. But this is Santa Barbara, where an appeal —much like hope — springs eternal. In the meantime, the County of Santa Barbara has authorized as many as eight retail storefronts — no more than two per each of the five supervisorial districts — but the California Coastal Commission has to sign off on that plan before permit applications can be processed. It remains uncertain when the Coastal Commission will hear the matter. County administrators have made it clear they have no intention of ranking applicants the way the City of Santa Barbara has. It will be strictly first come, first served. In the meantime, the City of Goleta has theoretically approved the possibility of having as many as 15 recreational dispensaries, though that number far exceeds what it would take to saturate the cannabis cravings for a city that size. Lastly, there’s Lompoc, which has set no cap on the number of legal dispensaries it might allow. Voters in Goleta and Lompoc have to approve such arrangements; presumably those elections will take place this November.